2 for 1 Special! This post is two walks in one. Because the neighborhoods of Western Addition and Lower Pacific Heights are so small, I just walked both in one fell swoop. 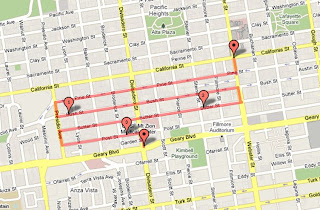 Your keen eye has probably noticed that I cut Post Street short by five blocks...yes, smarty pants, I did. I had to get home to watch Human Target. Don't judge. Okay - the walk. This is a cute area. The houses have style. This area also has some very pretty churches. 'Insanely attractive' may be a better way to describe St. Dominic's, which gives Grace Cathedral a run for its money. Gorgeous. because this neighborhood does not have a dial tone. On the bright side, it will have smooth pavement pretty soon! I agree that house is my favorite too - so cute!